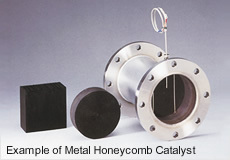 Metal honeycomb surfaces are coated with catalysts using precious metals such as platinum and palladium to provide high-performance honeycomb catalysts for VOC treatment etc. The metal honeycomb structure has a larger surface area than conventional structures with the same number of cells. The metal honeycomb structure has a high cross section aperture ratio, reducing the drop in gas pressure. The metal catalyst structure has a high physical strength against drop impact and pushing force. Can be reactivated and recycled (VOC treatment type).